It's been a while since my last post... probably because I've gotten the basics off my chest. 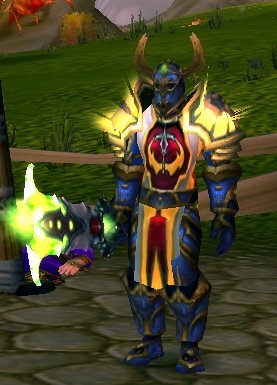 But today I'm celebrating a little milestone, a tale of hope for all you Ret Pally's out there. After 200+ games in 2v2 I was getting a little concerned that we'd stay in the 1500's forever. In the last three weeks though, I've been able to increase my (unbuffed) attack power from about 1450 to 1720 and add another 50 resiliance or so. I can tell the difference. Druids, Priest and Warlocks are still hard, but no longer an automatic loss. In fact 3 of my wins this week came from a priest/rouge combo... the extra AP gives me enough DPS to out damage the priest (and most other healers) as long as I play it right. And use my two stuns back-to-back at the right time, then they go down and I still have mana.... When's the right time? It's when the healer is below 40% health, and is gearing up for a big heal. The difference I'm getting from AP has me looking forward to Arena Season 4 and the new gear it will provide... In fact, my next article will deal with the upcoming patch 2.4 changes and after thta I'll talk a little about the Season 4 rumors.